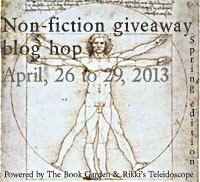 You all know how much I love anything that isn't fiction, so obviously I was thrilled when Rikki from Rikki's Teleidoscope came up with the idea of a giveaway hop dedicated to all that is non fiction. After a brief discussion about how to go on about it we decided to start by getting the word out (today, obviously) and hoping for fellow non-fiction enthusiastic bloggers to join us. No matter if you simply want to share the non-fiction love or just want to get rid of some unwanted non-fiction books on your shelves (shame on you, but you shall be forgiven if you join us) let's make this the first of many fun hops! For more information and to sign up for the giveaway hop, please head over to Rikki's respective blog post!